This card depicts a woman loosely bound, her hands behind her back. 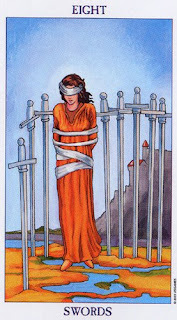 She is blindfolded and is flanked by 8 swords pegged into the ground. It speaks to us of restrictions, but also of the ability to break free from restrictions. Spartacus was a Roman slave who was sold for a gladiator. A grim fate indeed. Yet, he refused to remain captive and broke free. This encouraged other slaves to break free and to join him in the largest slave revolt in Roman history. The Roman threw everything they had at him yet he remain undefeated and in fact defeated his enemy in battle for a year. He was finally defeated through trickery and superior Roman forces. Spartacus could have remained a slave, instead he chose to break free. In the process, he provided inspiration to many other slaves, some of whom joined him. Approximately 70 gladiators managed to free themselves when Spartacus broke free. As he started defeating the Roman forces who were sent after them, he so inspired other enslaved men that approximately 100,000 slaves also broke free to join him in this defiant act. Spartacus somehow managed to feed and shelter his men as he led them into one battle after the next. Although Spartacus was eventually defeated by the Roman Crassus, history remembers Spartacus, not Crassus, for the inspiration that he gave to so many slaves. Sometimes when we break free from bad habits, or a corrupted system we inspire other people to do the same. If we can stop ourselves from accepting defeat when we are faced with restrictions that we have the ability to free ourselves from, others become inspired, reasoning if we could do it so can they! 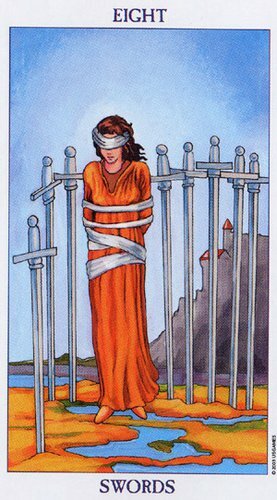 The woman in the card who has her hands bound behind her back and who has been blindfolded can free herself. She need only want to. Sometimes we find it easier to wallow in self-pity or despair instead of taking a stand and releasing ourselves from the restrictions. When this card appears we might want to ask ourselves whether there is some aspect of our lives in which we feel bound or restricted. If so, now is the time to consider liberating ourselves instead of accepting our lot or misery. It is within our power to do so.